Improving business performance through Strategic HR – that’s exactly what HR should be designed to achieve. I represent UST Global which is an IT SERVICES company headquartered at Aliso Viejo, California started in 1999. Currently, it is a 14,000 employee company with a global presence in around 20 countries. We follow a client centric model in our services so that we maintain a focused approach towards clients and maintain a deep relationship with them..
Strategic HRM can serve as magic glue which can fix all the performance issues of an organization.SHRM enables the execution of the right HR strategy to enable business to achieve its goals. I would like to illustrate this with the HR strategy model at UST Global. 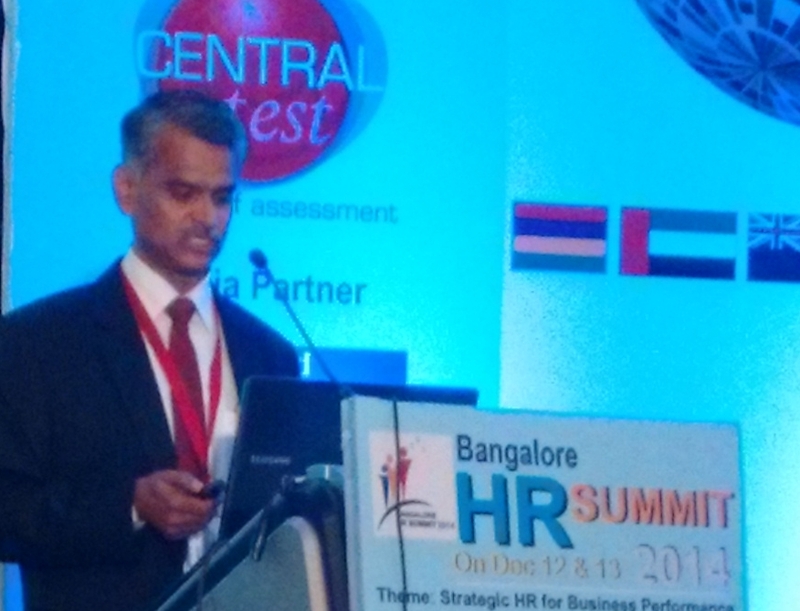 “HR as a strategic function” is a much debated topic for the past couple of decades. There is much more discussions on HR being a strategic function than any other support functions. Finance for example believes that they are by default, a strategic function, while HR leaders need to prove this fact over and over again. This comes from the fact that unlike finance, which deals with money, HR deals with people who have emotions and feelings. However the fact is that HR professionals have failed to balance the need to be “humane” with the need to be business focused. Business Acumen is something that is not very common in HR function. To have a competitive edge over our competitors like Infosys and TCS, we have taken up a challenge to expand our business in uncaptured and non- conventional markets like Latin American countries. While US and India are Key markets, we have found that the Latin American countries as attractive locations as they are growing with a GDP growth rate of 4-5 per cent. We have worked with the Mexican government and we have put forward a proposal “to create mass IT resources in Mexico”. Our employee value proposition is to train 30,000 resources and hire 10,000 resources as we scale up. Through this proposition, we have challenged existing stereotypical beliefs about Mexico (through which the country is quite often projected merely as a drug lord’s paradise) and we are transforming Mexico by bringing IT into the country. By transforming a nation, we are living up to our mission of Transforming Lives. How did we do that? HR has supported the organizational growth by providing the right talent at the right time by adopting near shoring strategy where we have engaged with Recruitment firms to catapult our recruitment efforts. Our learning program has played a significant role in setting up new centers, as part of UST’s dynamic business growth. Training locally hired new employees – both fresh and experienced – involved an entirely new kind of customization taking into account Mexican educational and socio-cultural climate. Our mission is transforming lives and we ensure that our mission is brought to life through various activities that have social impact like these. Each sub unit of HR aligns itself in such a manner that it supports organizational growth and strategy. An illustration for this is our GAMA Strategy whose intent is achieve business impact and social impact through our learning programs. Hence we can say that the first step in improving Business Performance is through Strategic Alignment of HR Strategy to Organizational Strategy. HR is also responsible for the talent management in organization. UST Global is always known for its innovative and result oriented HR interventions which support the business growth. Social Impact: We have touched lives people of many inner city minority women. We have been able to give them an opportunity to better their lives. We have given a chance to their future generations to lead a better life. This is what we call as “SOCIAL EMPOWERMENT THROUGH TECHNOLOGY”. What more is needed if we are able to get 60 new logos through just one impactful program. SIUA is one such program which had a direct impact ion business performance. We must all strive to create such programs which help in creating a business impact. Another Innovative HR Tool at UST Global is COLORS: Colors encourage team building and collaboration and provide an opportunity for employees to develop their personalities and leadership skills by pursuing aspirations outside their functional requirements. The program has seven colors, with each Color representing an organizational dimension. We have our leadership immersion program at UST Global through which leaders hired from external market are integrated into the organization through a highly focused business and leadership immersion program in addition to the regular on-boarding process. New hires at critical roles are provided with a 30-60-90-180 day plan, which are mutually agreed upon and reviewed at regular intervals. In USTGlobal, HR plays a pivotal role in acquisitions too. HR takes up the responsibility for the alignment of the talent in the acquired company to the culture of UST Global. HR ensures that it plays the role of integrator and makes the new employees to be part of the new system.HR acts as a proactive partner and it helps the organization in a quick engagement by Responding to learning needs through faster modes of Learning Penetration, Providing the right talent at the right place -Local Hiring, Ensuring Compensation to be on par with industry, Localization – Keeping up the global values of company but taking into consideration local culture. Our HR at USTGlobal contributes to the improvisation of business Performance by faster adoption of new skills and new technologies in the organization and by Deploying talent through training.